"It’s hard to explain," said director Benh Zeitlin on the plot of his Oscar nominated film Beasts of the Southern Wild, during a visit with Vocalo Morning AMp hosts Molly Adams and Brian Babylon last summer. Beasts was nominated last Thursday for four Academy Awards: Best Picture, Best Directing, Best Actress (Quvenzhané Wallis), and Best Adapted Screenplay (Zeitlin and Lucy Alibar). This is Zeitlin&apos;s first feature film, but it&apos;s already won the coveted Caméra d&apos;Or at Cannes and Grand Jury Prize at Sundance. Wallis was only five years-old when she auditioned and is the youngest ever Best Actress nominee, now at 9 years-old. The screenplay is an original story, based on a one-act play by Alibar, notable in an era dominated by Hollywood blockbuster franchises. But what&apos;s the film about? "When we had to talk about our film to Hollywood fatcats we would just pitch A League of Their Own, because there was just no reason to pitch our movie. It just didn’t work," joked Zeitlin on Vocalo, "A League of Their Own you could pitch, it’s real snappy." “It’s kind of a folktale about this tiny little hero, who’s this little girl named Hushpuppy, who lives with her father on the wrong side of a giant worldwide water protection system and their town has basically been cut off and they’re dealing with a series of environmental catastrophes and kind of mythological beasts charging at their town," he said. Thankfully Zeitlin is a far better filmmaker than pitchman, but yes, it&apos;s hard to explain. Beasts is a magical modern myth. Fearless six year-old Hushpuppy lives with her tough but loving father Wink on a mysterious bayou island known as The Bathtub. The community is isolated but tight-knit and happy, thanks in part to free-flowing booze. Together they weather Wink&apos;s illness and the apocalyptic storm, but in the end Hushpuppy alone faces the beasts, literal and looming. Wink is played by Dwight Henry, not an professional actor but of all things, a professional baker. Known as Mister Henry to regulars at his bakery and café, The Buttermilk Drop in the Treme neighborhood of New Orleans, the Katrina survivor and father of five, delivers a fiery, intense performance born of vérité. Wallis as Hushpuppy however, quietly enchants us into her fairytale, a world filled with animal friends and adventures. She wears not delicate wings, but dirty white undershirt, orange underpants, and oversized white shrimp boots. Hushpuppy does occasionally punctuate her wonderland with screams and burps. "Get your pants on man!" shouts father to daughter matter-of-factly, right before he spears a whole raw chicken, head and feet on, from a chest cooler half-filled with ice and bottled beer. He throws the bird on an ingenious windowsill wood-burning grill. When done, he rings a bell and calls "Meat up time! Meat up!" Hushpuppy calls back happily, "Meat up time!" — followed with yelps and barks. Hushpuppy tears into the tender carcass with bare hands, throwing a scrap to her dogs, just as Wink says, "Share with the dogs." Their breakfast routine displays a compassionate, practiced, primal ballet, reminiscent of a Disney princess movie, but far more beautifully brutal. One of the most heartbreaking scenes follows Wink&apos;s temporary disappearance. Hushpuppy walks slowly up the steps to his house and calls "Daddy? Meat up time." There&apos;s no reply. But our tiny hero is a survivor, and independent survivalist. She declines a boat ride and food from her teacher. Instead, Hushpuppy pulls down her surrogate "Mama" — a Michael Jordan jersey that once belonged to her real mother who "swam away"— from its place of honor on the wall of her house. She hangs it on a kitchen chair to carry on an imaginary conversation while making herself a canned gravy and cat food stew, after lighting the gas stove from across the room with a flame thrower. Don&apos;t worry: our little hero wore a football helmet for safety. Her father reappears but their reunion is briefly violent. 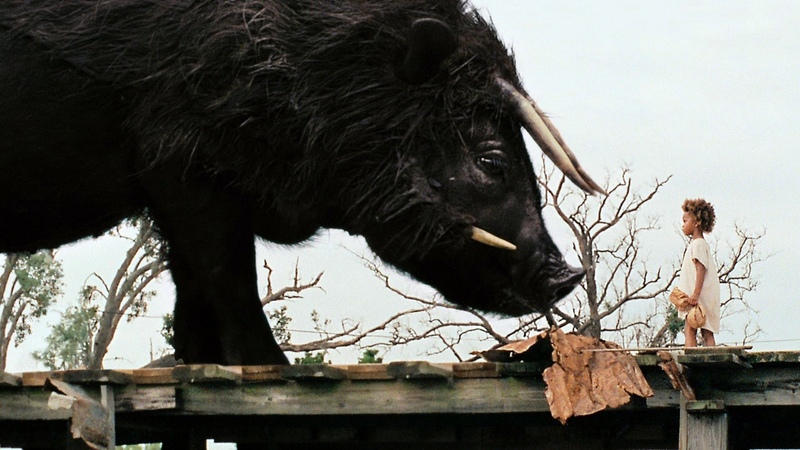 Hushpuppy lands a physical and emotional punch that sends Wink into a seizure and, she believes, releases the storm and beasts known as the aurochs from their icy suspension. After Katrina, Tōhoku, Sandy, the drying of the Mississippi, and the searing of Australia, Beasts is the childlike folktale we tell ourselves, but with more hope and joy. Also of note, Welcome to the Bathtub is the film&apos;s lovely interactive immersive website, designed by Watson DG, with dynamic illustrations and quotations, live Twitter stream, and mesmerizing soundtrack composed by Zeitlin and Dan Romer. Watch Beasts now in iTunes, or in its return to theaters, starting January 18 at the Century Centre Cinema in Lakeview. Last week Mister Henry announced the opening of a Mr. Henry&apos;s bakery and café in Harlem this spring. Working with the Nobu Restaurants managing partner, he mentioned a Chicago location may be in our future too. In the meantime, The Buttermilk Drop is taking orders for his signature buttermilk drop biscuits, plain donuts, and king cakes online now. Mardi Gras, Fat Tuesday, is February 12 this year. The Oscars air February 24 at 6 p.m. CT on ABC7.